Rahul Dravid: Rahul Dravid : Not a super-star! Every word in this article is written by Prosper Ryan. In my very recent flight, I happened to meet a passenger from Mauritius, her name is Andrea ( She was reading a book on India & it had a Hindi phrase, and she took the wrong person to ask for the meaning, it was me.Thus how the conversation started ).She said that she is on her way to Kerala, and then coolly said that she is also going to meet Rahul Dravid. Err, I was shocked & words started trembling, I didn't know what to say.After a pause I asked her the reason for the visit. She said that she & her brother is going to invite Dravid for her brothers wedding ( I imagined that her brother should be some icon or a relative to Dravid ). During Team Indias 2007 world cup campaign in West Indies, Wilson was working as an Internship student in one of the hotels where Team India stayed. Wilson is neither aware of Team India players nor follow cricket at that times. Wilson worked as a Trainee Instructor in the Hotels Gym and he was also responsible to authorize visitors entry into the gym ( As the hotel is filled with Cricket Stars & fans, the gym was restricted only to certain guests ). Dravid happened to visit the gym, Wilson asked Dravid for his identity key which Dravid didnt had with him. Wilson had no clue about Dravid or his stature, he requested Dravid to get the Tag for him.Dravid apologized to Wilson & started walking back to his room to get the Tag. Some other staffs inside the Gym stopped Dravid and they ran towards Dravid to stop him and apologised & told him that Wilson is a trainee and new there and requested Dravid to use the gym, but Dravid refused politely and said not to misguide the young trainee ( Dravid saw Wilsons name tag ), Dravid said Wilson is doing his job, so let him do in the right way.Wilson was soo embarrassed to know the fact that he stopped Team India's Captain on the door, same time he was stunned with Dravids politeness. 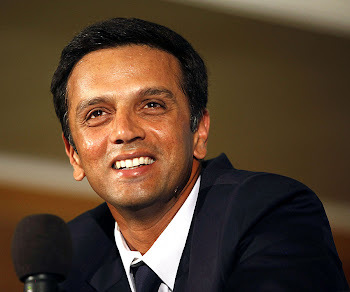 Wilson then started having special attention over Dravid during Team India's short stay in their hotel, and Dravid also got into few conversations with Wilson every-time they meet in the gym and other places in the hotel.Wilson being a graduate on Fitness course, shared many of fitness tricks with Dravid. Days later India lost to Sri Lanka, back to the same hotel. Wilson realized that it will be Team Indias last night in that hotel, as they will be moving to another hotel the next morning. Wilson as a trainee was collecting '' Guest satisfaction feedback form '' which can be an added advantage to him at the end of his Internship, Wilson also got introduced with many other cricketers and he got his share of attention with many players with his cool & jovial nature, so he just gave it to all the cricketers he saw on that day including Dravid. Team India were already in a very bad mood, and most of the players didn't turn for the dinner, were Wilson thought that he could ask them about the form. The next day when Wilson was back to work, he checked with the hotel whether anyone had left the Feed back form for him, and he found only one, thats Dravid's..!! Dravid wrote a few lines for him and undersigned just as Rahul with his home address as contact details. Team India was checking out, Wilson spotted Dravid, he first apologized for disturbing him on a dull day when India lost to SL and almost crashed out of WC, Dravid stopped him and said they did their job and didn't performed well & Wilson did his job and gets his reward ( The feedback form ). Wilson was speechless, and he thanked Dravid for filling up the '' Guest Feedback Form '' and hesitantly asked Dravid why he didn't mention that he is a Cricketer/ Captain of Team India in the '' Occupation '' field, but left blank. Dravid said him that he was impressed with Wilson because he found Dravid just as a hotel guest, not as Team India Captain or any special guest...! Wilson then got Dravid's email address & promised not to use Dravids name for any reference for his future jobs, will always have Dravids Feeback as a personal souvenir. Andrea said that Wilson & Dravid contact each other regularly .....They happened to meet again in England in 2009 as well..!! To Wilson , Dravid is still a hotel guest who turned into a humble friend/well-wisher..!! I thank Prosper for sharing this with all of us. great story man!! dravid is truly a humble man very rare.. The lion is, however, rarely heard - much more seldom seen..on the media..
i m too the great fan of rahul dravid n hv a desire to meet him,i dunt know wheather it wud b fulfilled or not,bt mh gud wishes are olwz wid him...!! and once a day will come wen cricket is known for his name,.,.,.!! Dravid is just awesome. Has a magnetic personality n unarguably a person of dignity! I AM A GREAT FAN OF DRAVID AND I AM PROUD TO BE.I HAVE NO WORDS TO SAY BUT MY EYES ARE WET WITH TEARS AFTER READING THIS STORY.DRAVID IS THE ALL TIME GREAT IN EVERY FIELD. Every day I go pass by Chinnaswamy stadium, I see great wall of Indian cricket (Class, Committment, Consisaency).